The debate over hydraulic fracturing, or fracking, to extract oil and gas has largely focused on the chemicals injected underground and their potential impact on public health. Now environmental groups are turning their attention to the waste produced by simply drilling a well in the first place. Water regulators in the Central Valley, home to most of the state’s oil production, will consider the issue at a meeting Thursday. Drilling mud is the slick concoction used to cool and lubricate a drill bit, and it’s used for all kinds of wells, not just oil and gas. After a well is drilled, the mud and other wastes from drilling the well are often stored aside in unlined pits near the drilling site. Five years ago, the Central Valley Regional Water Board included drilling muds in a broad waiver that exempted drillers from having to report and monitor those muds, saying they posed little threat to water quality. Other exemptions included swimming pool discharge and water from air conditioners. 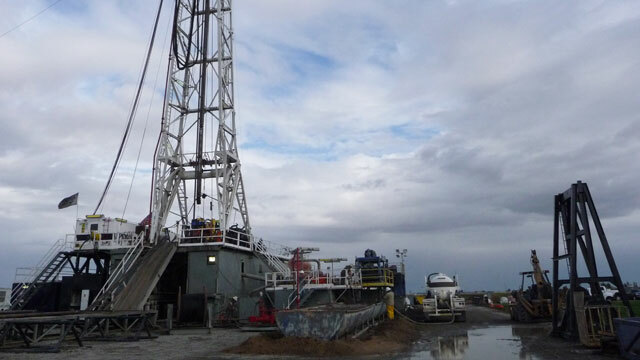 That waiver is now up for renewal, and environmentalists say when it comes to drilling muds, oil and gas companies should not get a free pass. Especially since the last time the Regional Water Quality Control Board looked at the health effects of drilling muds was back in 1981, before the fracking boom. “The most obvious step is to take a time out and really update our understanding of drilling muds and the risk they pose, especially with the spread of new techniques like fracking,” said Hollin Kretzman, a staff attorney with the Center for Biological Diversity. Kretzman says the waste generated from oil wells could contain harmful chemicals and contaminate groundwater. But after reviewing comments from several environmental groups, the Water Board’s staff is recommending that regulators revoke the waiver for drilling wastes while they study potential health effects. Meanwhile, proposed fracking regulations would require the State Water Quality Control Board to put together a regional groundwater monitoring program for areas where well stimulation, like fracking, takes place. But those rules are largely concerned with chemicals injected into the ground, not drilling muds or the waste from simply digging a well.